Nahko And Medicine For The People have added 12 additional headline tour dates this summer with support from Xiuhtezcatl and Raye Zaragoza on select shows. The new stops include shows in Knoxville, Nashville, Phoenix, and Omaha. Tickets will be on sale Friday, March 23rd at 10:00 AM local time at: http://nahko.com/tour-dates/. "Our 2018 summer just got even better with these added dates! Our band will be focusing on a high energy performance that mixes our 3 records and my solo record, My Name is Bear, together in a full power roots rock show” shared Nahko. “Keep your ears peeled if you're already a fan, we'll be throwing some treats in the mix for sure! Grateful to be on the road with so many amazing people this summer and to be coming to these special towns to headline our own show. Mahalo to our Medicine Tribe for the outstanding support!" 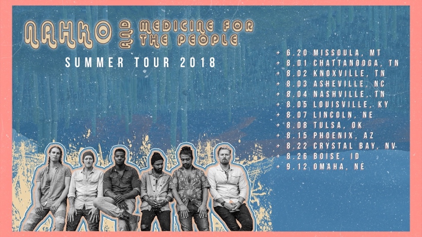 Nahko And Medicine For The People will provide support for Dispatch’s summer tour which kicks off on June 16th in Vail, CO and makes its way across the US before wrapping in Boston September 20th and 21st. They will also join Zac Brown Band for their stadium tour in Atlanta, Toronto, and Detroit on June 30th, July 13th, and July 14th respectively.